One of my favourite writers is Romain Gary. It’s our common heritage and interests through which I relate so well to his books – we both are of Russian-Jewish origin, we both have a passion for aviation, we both write, although so far, he is far more successful than I am. And we both live (well, he doesn’t live anywhere anymore) away from Russia. I left Russia more than 20 years ago and I don’t miss it all that much – I was probably too young when I left. But every now and then I do get a bit nostalgic. And like Romain Gary, I get the same cure for the nostalgia – pickled cucumbers Russian style – in brine, with garlic and dill. With Borodinsky bread. Russian pickles might be an acquired taste, but Bogatir supermarket, where I go for my taste of Russia, has all things Russian, like pelmeni, pirozhki and vodka. It also sells books and Russian souvenirs, for a wholesome Russian experience. 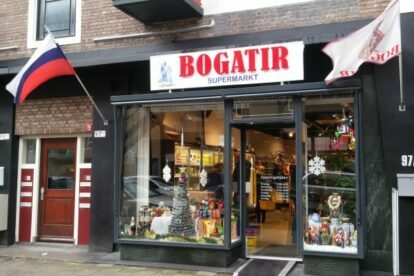 To re-live that Siberia Express experience, get a good pickle or buy that samovar you’ve always wanted – Bogatir is the supermarket for you. Na zdorovje!